The biggest and most important change was getting rid of these ugly brown tiles. I seriously hate them! I used to crinkle my face in disgust every time I walked in the bathroom - dramatic but true bahaha. 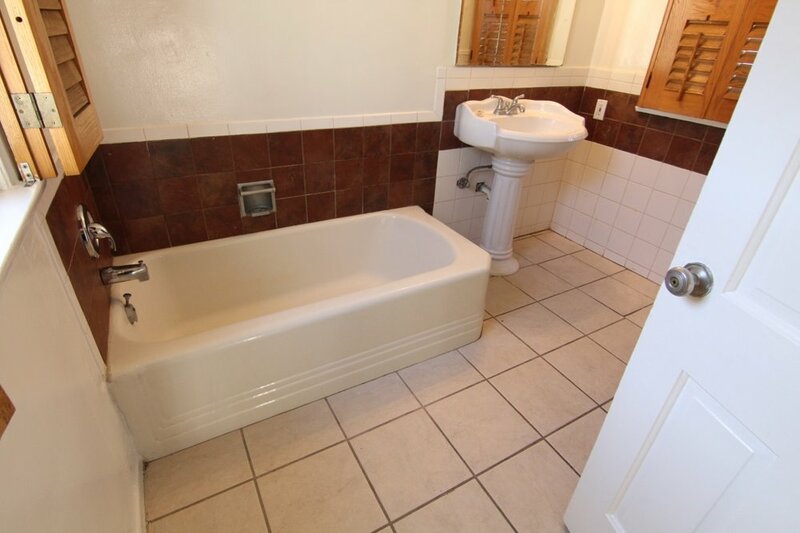 Since we're renting our house, I don't want to invest too much money into things we won't be able to take with us to our next home - which meant getting the tub/tiles refinished was not really an option. I looked into it originally thinking maybe it would be a possibility - but after getting a quote and realizing how much it would cost ($700!) we ultimately decided to save that money and get a little more creative. So how did these pretty blue-green tiles come about without refinishing or re-tiling the space? The secret is TILE STICKERS! High quality vinyl peel and stick stickers that cover up any sort of flat surface such as tile, glass, metal, ceramic, or wood. Such a great option for renters or anyone on a budget, since stickers are much more affordable than changing out the tile and they're removable once you move to a new home. I used Bleucoin for our stickers - I loved the options they have on their site, and they worked with me on custom sizing so everything lined up neatly. I decided on their plain solid tiles in color Como. Love this shade so much! Next up was taking down the big metal towel bar on the wall above the tub faucet. It was really ugly and we have towel hooks already on the door and another wall, so it wasn't necessary. Instead we replaced it with a hanging shelf from Urban Outfitters, and placed a nice drippy silver pothos on it. I love seeing the tendrils drip down while I'm in the tub! Another big change was taking down the wooden shutters on the windows (seen below). I just wasn't vibing with those big clunkers, so we exchanged them for airy curtains instead. Our bathroom didn't come with any storage other than the medicine cabinet, and as someone with a million beauty products it was important that I have somewhere to put things. I chose a bamboo cabinet to hide away all my hair care & travel size items - brushes, curling iron, hair dryer, products, etc. I also wanted a flat surface to be able to place items I use daily, as well as plants and candles. I knew I wanted a stool next to the tub to act as a lil "good vibes" altar for when I take a bath. Incence, candles, sage, salt lamp, crystals, and prickly bbs are my ultimate good vibes. Love these pretty Smyrna Collection Turkish towels too. This wall above the bathtub was just begging for art. I had been looking for a beachy scene that would match our new tiles and the room in general, but I wasn't having any luck. Then I thought - wait, why don't I just use one of my own photos? I chose this shot I took last summer on a Malibu outing with Eddie, and decided to use Framebridge to print and frame it for me. It was my first time using their site and they made it such an easy, fun process. I just uploaded my photo, chose what size I wanted it to be, picked my frame, and they shipped the finished product to me. Viola! It's such beautiful quality and I'm obsessed with the wooden frame it's in. Now every time I'm in the bathroom I remember that fun day in Malibu. For above the toilet we hung this wooden floating shelf from Urban Outfitters. Our bathroom didn't come with a toilet paper holder on the wall so we chose this pretty copper and wood piece. Just add some art, plants, candles, and this nook was complete! Now I smile instead of frown when I walk into the room :) And my bath times are so relaxing and peaceful. It's like aromatheraphy with all the incense and candles! So what do you think of the end result? Let me know your thoughts in the comments! Many thanks to my friends at Urban Outfitters, Bleucoin, and Framebridge for all my bathroom pieces. This redesign wouldn't have been possible without them!